On Tuesday, U.S. authorities lowered the number of arrests during the confrontation to 42 from 69. Rodney Scott, chief of the Border Patrol’s San Diego sector, said the initial count included some arrests in Mexico by Mexican authorities who reported 39 arrests. “That has happened before and, if we are rocked, that would happen again tomorrow,” he told reporters. “Why is a parent running up into an area where they know the tear gas is forming and it’s going to be formed and they were running up with a child?” the president asked. Without offering evidence, Trump claimed some of the women in Sunday’s confrontation are not parents but are instead “grabbers” who steal children so they have a better chance of being granted asylum in the U.S.
Trump portrays them as a threat to U.S. national security, intent on exploiting America’s asylum law. Others insist he is exaggerating to stoke fears and achieve his political goals. The military’s role is limited largely to erecting barriers along the border and providing transportation and logistical support to Customs and Border Protection. U.S. Customs and Border Protection Commissioner Kevin McAleenan said the administration’s concerns about the caravan “were borne out and on full display” Sunday. 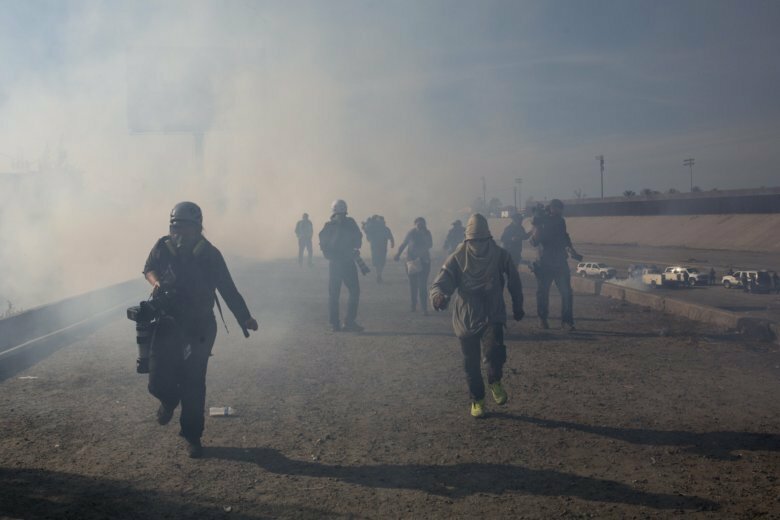 Border Patrol agents launched pepper spray balls in addition to tear gas in what officials said were on-the-spot decisions made by agents. U.S. troops deployed to the border on Trump’s orders were not involved in the operation. Mexico’s Interior Ministry said in a statement it would immediately deport the people arrested on its side of the border and would reinforce security. Border Patrol agents have discretion on how to deploy less-than-lethal force. It must be “objectively reasonable and necessary in order to carry out law enforcement duties” and used when other techniques are insufficient to control disorderly or violent subjects.